Cheesehenge, For the Sake of the Land! Well, after a long pause, which of course you know was caused by a freak double computer calamity because you follow us on Twitter, we are back with this excellent cheesehenge which you have of course already seen because it was our Friday foodhenge on Twitter back on March 5! Laura Mousseau tells us, “Cheesehenge was created by Mark Stabb for a Nature Conservancy of Canada Ontario staff retreat (if you could link to the Nature Conservancy site for Ontario somehow it would be much appreciated! )” I suppose we could — [link]!. We’re, like, all in favour of the, you know, earth an’ s**t! This is a particularly good cheesehenge. Observe tthe guacamole ground representing Salisbury Plain, inner trilithons that appear to be taller than the sarsens in the outer ring, and–la pièce de résistance–the careful placement of the inner trilithon horseshoe facing the the uprights with the three adjacent remaining lintels. Some observation definitely went into this, although we would not go so far as to say as someone does on the video (Oh, yes!) that it is archaeologically correct. 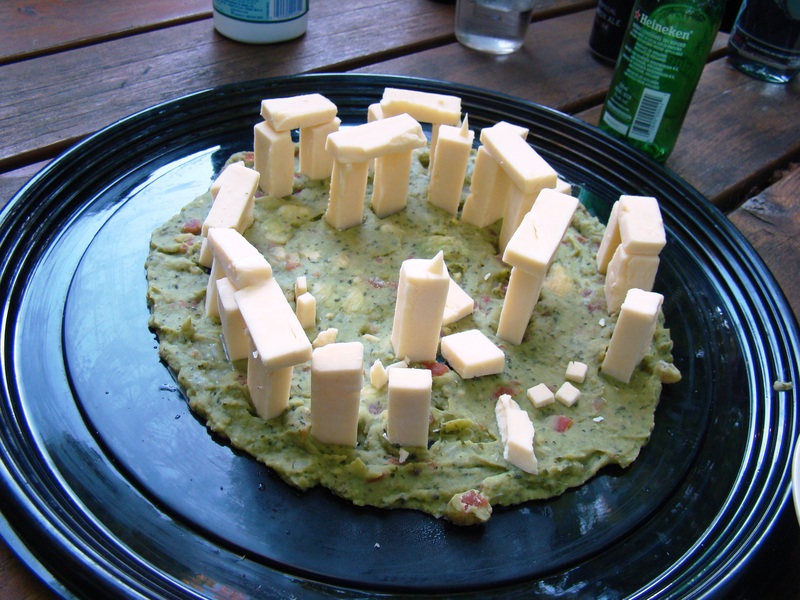 Cheesehenges, as we have said before, are among the commonest of henges, probably because cheese is capable of being cut into rectangular shapes and, of course, it is often served with alcoholic beverages, some of which appear to have Stonehenge-generating properties. We have posted two cheesehenges before this. See here and here. Score: 7 druids! If that seems high to you, you should know that we give extra consideration to treehuggers. It seems likely that the land was what it was all about back in the days of the original builders of Stonehenge, as well as over a millennium later in the days of the druids. Even today we all depend on it. Good to remember, people! So kudos, Mr. Mark Stabb! Nicely done. The only problem here is all those people singing “dooooo” at the beginning of the video. Perhaps goofiness, in the end, is what makes the world go round. We sure hope so! Until next time, whenever that is, happy henging!